I just got back from a four day trip around the Savannah Isles. Gary and Chris were the lucky chaps with great tides and a variety of weather conditions that made the trip most excellent. The plan was to come down the Wilmington River, circumnavigate Wassaw, paddle up the front of Little Tybee and Tybee and then back to home up the Savannah River...3 nights and 4 days. The trip went pretty much according to plan except for the last leg up the Savannah River. Strong west winds on the last day caused us to pull out on Tybee. We spent a couple of days on the water filming a segment for 'Georgia Outdoors' Tv show earlier this week. 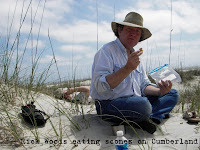 A day of instruction followed by a day trip to Little Tybee was captured by the camera. The program will air in the Fall. We will be intersted to see how they put it all together and represent us. We had turned down a previous request to be on tv, not being a big fan of the media. But this time, we dicided to give them the benefit of the doubt...as a test. Anyway, we had a fun couple of days doing something a little different and that's what it's all about.. So it was a quick trip up to the East Coast Kayak Symposium this last weekend. I got a ride up with Mike Robinson and arrived Friday evening in time for Brian Smiths presentation of his Pacific Horizon Film. Great to see local boys Richard Davis and Dave White up on the big screen. Even better that Dave was sporting his SC&K cap. The evening was spent tailgating with Brian Smith, Nigel Foster, Dale Williams, Michael Grade and a flask of Pappy Van Winkle curtesy of Mr Robinson. Brian is coming to the East coast to film a sequel to his PH vid and plans to be here around October. Hopefully we can wrestle up a few gators for him. 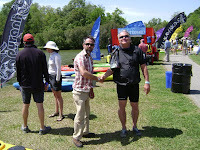 On Saturday we strolled among the vendors saying hi to various friends and associates in our paddling world. I then spent a couple of hours at the P&H booth rapping with my homies, while Mike passed his 'ability to focus' theshold. We fled the scene before tea time. The temperatures plummeted on a chilly Monday evening as we began shooting the latest instructional video in the Ben Lawry series. Local paddlers were tempted out to the lake shores with the promise of free beer and all the coaching they could stand while the video cameras rolled. Thanks to everyone for their smiley faces and willingness. You will be rewarded somehow. S.O.T Surf Classes are Rocking ! Our paddle surfing program has been up and running for over a year now and continues to improve in quality and content with each class. The quality of the boats and gear also greatly enhances the experience. Today's Sit on Top class was no exception with two students and two trainee instructors taking part. We are currently training Barry Shrum, formerly of the U.S Surf Team, to co-teach and conduct our advanced surf program. But the Intro classese are where it's at. The beaches are empty and the waters warm making it the perfect time to get the stock. And the best things about this class is that it's an absolute blast requiring zero skill level....great for family's, kids and anyone in need of some light excitement. Next class is on the 27th April. Sign up now. Scones and tea were once again high on the menu at Cumberland this past week. And fantastic trip we had of three days on Georgia's longest barrier island. Great weather, food and company makes for lasting memories and we had the lot. For it's busy time, Cumberland was very mellow and the trip went smoothly, with a few stories and laughs shared along the way. One of our company was Rick Woods, a local photographer currently working on a book of the coast. We were to share the Brickhill camp with another group of 8 paddlers, but they failed to launch, somewhat put off by the Small Craft Advisory...a wise desision on their part . A You Tube AV will be posted just as soon as I get the shots from Rick. We are pretty happy with the improvements to the Easky's. They look like a much better boat and really do paddle very nicely, turning and carving with the flick of a hip. It's now comparable in price and quality to the W.S Tsunami, but with way better handling characteristics and performance. Maybe you'll get to try one on your next program with us.